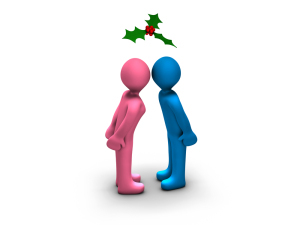 Are you hoping to catch someone under the mistletoe this season? Kissing under the branches and berries of a mistletoe sprig has been a worldwide tradition for generations, perhaps longer (the origins of the ritual are vague). Many people still find the tradition fresh and exciting every year, and you may be among those surprised with a kiss. If so, you’ll want to ensure that the person kissing you remembers the moment for the right reason. Atlanta dentist Dr. Peter Pate gives you these tips to ensure that your mouth remains kissable and ready for those mistletoe surprises. To keep your breath consistently fresh, your toothbrush and floss are your best friends. Oral bacteria, the culprits that bring tooth decay and gum disease, can also bring bad breath. Brushing and flossing your teeth at least twice a day will help control the bacterial population, inhibiting the number of germs available to pass gas in your mouth. Bacteria are not the only reason for bad breath. Strong foods, like onions and garlic, can also leave an unflattering impression. Unfortunately, these foods are metabolized and their stench passed to your lungs, where you will breathe it out until it dissipates on its own. If you happen to munch on a clove of garlic, sugarless gum and sugarless mints can help mask the odor. While embarrassing on its own merits, bad breath can often signify a deeper issue. For instance, tooth decay and gum disease can cause your breath to sour. Respiratory infections, diabetes, and some forms of cancer can also affect the body’s normal function, and persistent bad breath can be a symptom of these and other diseases. Visit your Atlanta dentist’s office at least every six months, or more often if Dr. Pate recommends, allowing him to inspect your mouth for early signs of disease. Early detection and treatment of dental issues may reduce the need for invasive dental work. This may also prevent an awkward surprise kiss this holiday season! To learn more, contact Dentistry in Buckhead at (404) 266-9424 to schedule a consultation with Dr. Pate. We proudly serve patients from the Buckhead area, as well as Sandy Springs, Lenox, Brookhaven, and the greater Atlanta area.